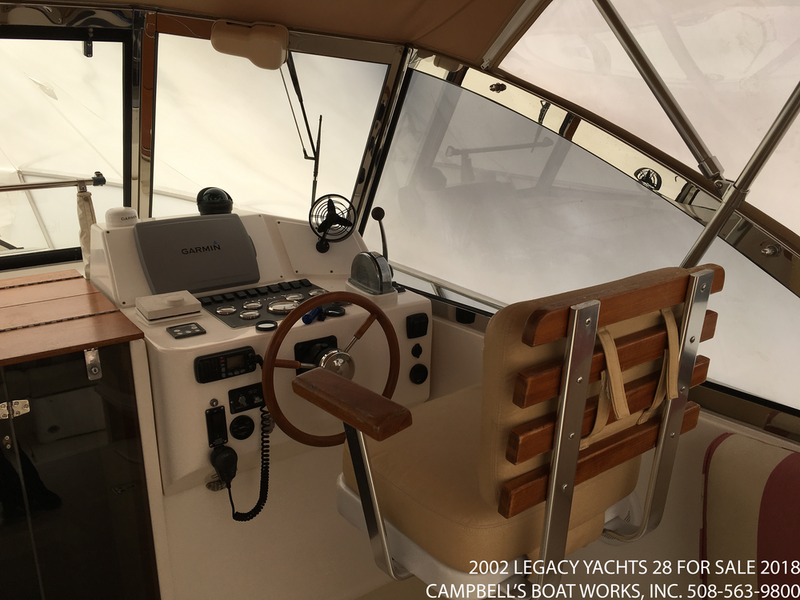 28 Legacy Boat For Sale — Campbell's Boat Works Inc.
A classic downeast look with a Flag Blue hull, Yanmar Diesel, ready for Summer 2018. Perfect for daytrips with the family or long distance cruising for two. Six foot headroom in the cabin and cockpit, excellent visibility at the helm. Ample storage in every possible location including the cabin, galley, cockpit, and aft deck. Comfortable seating throughout including a stylish transom bench seat, v-berth for two, full galley, enclosed head and more. Navigate easily with Garmin electronics and radar, Maxwell windlass, and bowthruster. This Legacy 28 has been professionally maintained, with a new canvas enclosure Spring 2016 and new turbo charger Winter 2018. On display in our storage yard, call to make an appointment!